This guest blog was written by John Rooney in partnership with Vusta Flooring – providers of some of the very best vinyl flooring available in the UK. What’s the best way of bringing something new to your home? A new colour scheme, modern furniture, a load of accessories? Sometimes the best way of freshening up an interior is to change the very thing you’re standing on – and there are all kinds of different ways you can go about it. Read on as Vusta Flooring – stockists of an extensive range of exclusive luxury vinyl flooring – take you through their tips for revitalising your flooring. Harder to clean and a harbinger of dirt and grime, carpets are more than a little dated, but you don’t have to break the bank on its replacement. Vinyl flooring can offer the aesthetic benefits of carpet without the expense of solid wood, while combining it with high quality underlay ensures that your flooring will provide all of the necessary insulation. Although there are fewer colour options available with vinyl – typically a vinyl floor will give the impression of a ‘natural’ flooring product – the fact that it can reflect light means it will brighten the home much more than even the most brightly coloured of carpets. Are you finding yourself feeling bored of the colour of your flooring? If so then a rug can provide the splash of colour you need to give the whole space a lift. 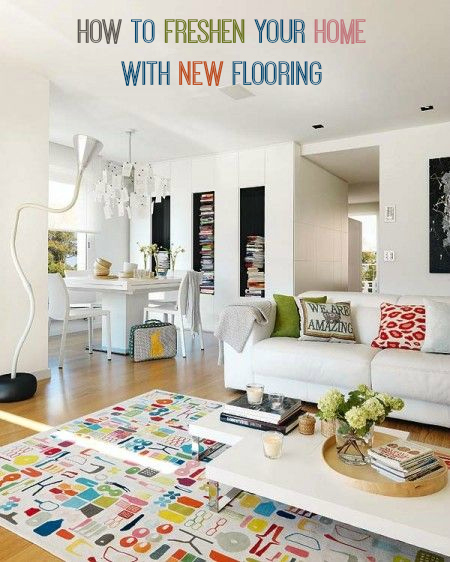 The benefits of this approach are that it is a temporary solution, allowing you to either change or remove the rug on a whim – unlike if you install a completely new floor. What’s more, they can be used to great effect to accompany the rest of your home’s interior design, with all sorts of colours and patterns available depending on the look you’re going for. How do you get the best out of your flooring? Let us know your advice on how to brighten up a space with vinyl, laminate or something a little more flamboyant in the comments below.